Have you ever made a miniature of a real airplane? Today you can make it on the computer! If your PC was built less than 6 years ago, it is powerful enough to become a real graphic workstation. You do not need to spend any money on the software: there are free (Open Source) programs that you can use for this purpose. So — you can start right now! I have practised this new kind of hobby since 2006, without any previous experience. The results are published on this site: details about the software and hardware, links to complete guides, some useful tutorials, scripts and plugins. You can even download my complete models from here! Since December 2017 I have worked on the R-1820 "Cyclone" engine for my SBD model. 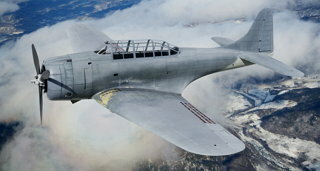 The SBD-1 and SBD-2 used the R-1820-32, SBD-3 and SBD-4 used the R-1820-52, while SBD-5 used the R-1820-60, and SBD-6 used the R-1820-66. The R-1820-32 most probably looks similar to the R-1820-52. 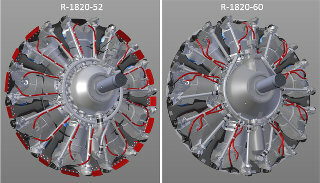 However, the later versions of this engine were redesigned, and most parts of the R-1820-60 differ from the -52. 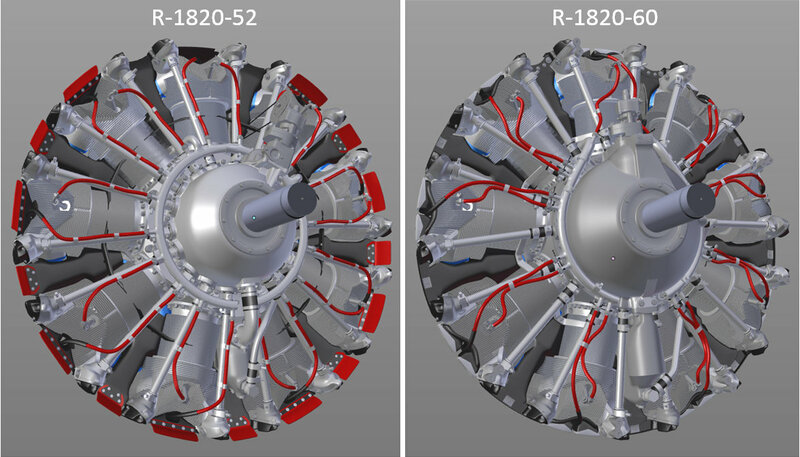 It seems that there are no significant differences beteen the R-1820-60 and -66. Thus I decided to recreate two versions of this engine: the R-1820-52 for the SBD-1, -2, -3 and -4, and the R-1820-60 for the SBD-5 and -6. See this blog for the progress reports. This SB-5 is painted in the tri-color Navy camofulage and weathered. I also recreated the landing gear details. See this blog for the progress reports. After a six months break I resumed this project. 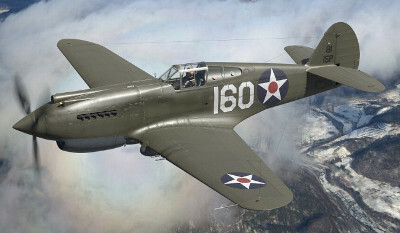 The SBD-3 is already painted (it uses the two-color Navy camofulage) and weathered. See this blog for my bi-weekly progress reports. 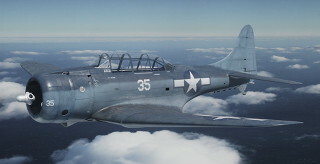 I continue my work on the SBD Dauntless model (I am simultaneously recreating all of its 5 versions). At this moment I modeled and unrapped in the UV space all of its basic shape. See this blog for my weekly progress reports. In mid-2015 I started to work on a new model: the SBD Dauntless. See this blog for my weekly progress reports. Of course, feel free to ask questions! You can use this blog as a supplement to "Virtual Airplane" guide. In general, I use in this work the same methods that I described in this guide. However, there are also some new ideas, for example - using the high-resolution photos as a direct, 3D reference. The beginning was harder than I expected, because I had to create my own scale plans of this aircraft! 2015-04-19: Spring cleaning on this portal! During last few weeks I reviewed and updated many pages on this portal (some of them were outdated). I also modified its layout, adapting it for the mobile devices. 2015-03-15: The third edition of Virtual Airplane guide is completed! Today I finished the third edition of my guide. It describes Blender 2.7, GIMP 2.8, and Inkscape 0.48. Finally I reached the goal: the book is available in the three popular e-book formats (PDF, MOBI, EPUB), and the manuscript processing is automatized and prepared for "following" the development of the software it describes. Now I have time to create another model! I suppose that the next edition of this guide will appear when Blender reaches version 2.8 (end of 2016?). 2015-02-24: I have published the last (fourth) volume of 3rd edition of Virtual Airplane book. The complete guide that contains all four volumes will appear a few weeks later - in March 2015. 2014-12-31: I have published third volume of 3rd edition of Virtual Airplane book. The last volume (IV) will appear in February 2015 (somewhat later than in the original schedule - I underestimated the amount of required work). 2014-09-07: I have published first two volumes of 3rd edition of Virtual Airplane book. This edition is updated for Blender 2.7. The remaining two volumes (III and IV) will appear to the end of this year. 1306 pages, over 4000 images. In this way the all the pages of this guide are already published - in its four excerpts (volumes). 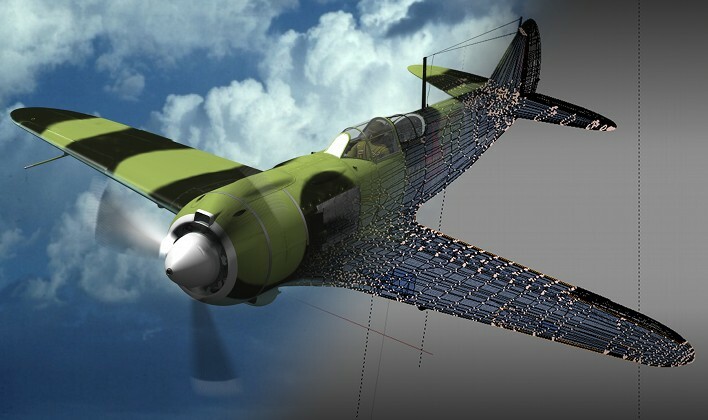 They describe in details the complete modeling workflow. The complete book "in one piece" (1307 pages) - soon. 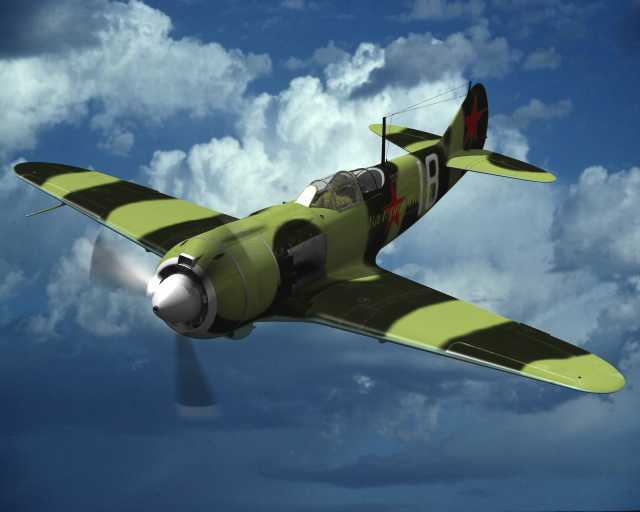 2013-05-26: I have updated the model of an USAAC pilot, now it is adapted for the Cycles renderer. This is a "side effect" of the work on Virtual Airplane book. Simultaneously I had to move the date of its publication to September 2013. (The first version of this book will be ready in June, but the translation into English and further revision will require additional three months). 2013-02-18: 75% of Virtual Airplane is completed. 2012-09-20: Over 50% of the English translation of Virtual Airplane is completed! See its Excerpt I about the blueprints preparation and the Excerpt III - first book about Cycles renderer! 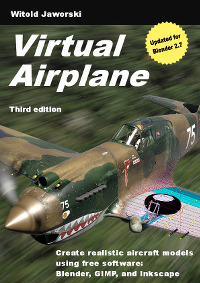 2012-08-21: I have written and translated a half of the second edition of this basic guide: Virtual Airplane. Due to the "non-linear" Blener development the finished material is dispersed between many different chapters. I have grouped them into so-called excerpts. Currently there are two: preparation of the reference drawings (Excerpt I), and preparation of materials and textures (for Cycles - Excerpt III). They will be released on September 2012. You can get their tables of contents from this page. 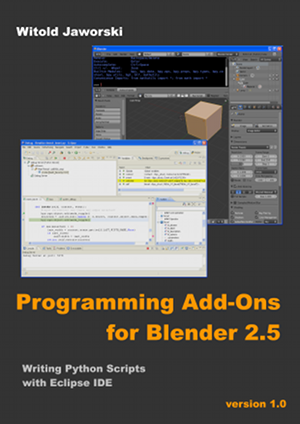 2011-08-22: I have written a new book about programming add-ons for Blender 2.5 - this time also in English! 2011-02-10: The book is finished! Ultimately, this first edition has 1112 pages and contains 3600 pictures. Actually, it is in Polish, only! Follow the link, to read its abstract in English. 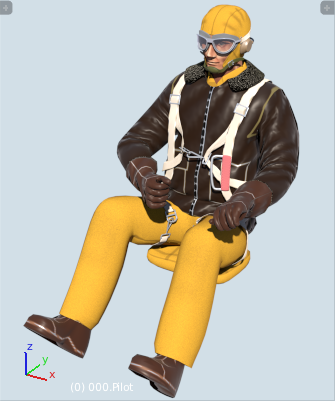 2010-11-01: A model of an USAAC pilot has been added! I am still working on the book. This is a "side effect" of this project - a model of an USAAC pilot. You can import it into the cockpit of your model. 2010-04-10: Vector texture plugin svgtex (v. 1.0) is ready! I have finished the tests of Blender texture plugin, that renders directly the content of SVG files. I have finished next chapter, about textures. Actually the book has 844 pages and contains 2400 pictures. The remaining 25% is still ahead! "Wirtualne modelarstwo" has grown up by another chapter about materials and the composition of the scene. It has reached 590 pages and 1700 pictures. I have started next chapter, about textures! It should be ready on February 2010. From March to August 2008 I have developed a Blender plugin for vector textures - svgtex. Then it was "put on the shelves", to be used in a book about e-modelling, which was just started. The work over this book took me more, than I had expected. After a year I have decided to present it, as a kind of "work in progress". It contains 530 pages and 1300 pictures. At the begining this site has different address. I have published it to a narrow audience, just to check if everything works properly.